The small Tuscan town of Castelluccio is preparing for its annual festival, a spectacular pageant in which a leading role will be taken by the self-exiled English painter Gideon Westfall. A man proudly out of step with modernity, Westfall is regarded by some as a maestro, but in Castelluccio – as in the wider art world – he has his enemies, and his niece – just arrived from England – is no great admirer either. And a local girl is missing, a disappearance that seems to implicate the artist. But the life and art of Gideon Westfall form just one strand of Nostalgia, a novel that teems with incidents and characters, from religious visionaries to folk heroes. Constantly shifting between the panoramic and the intimate, between the past and the present, Nostalgia is a fiction into which are woven the kaleidoscopic narratives of art, architecture, history, legend and much more. From a multitude of angles – history, geography, present and past residents, flora, fauna, festivals – a small Tuscan town is brought to teeming, vivid life. With a central storyline about an English expat painter, it’s as exhilarating as an Italian holiday. …a minor-key masterpiece of restraint, invention and the fine art of keeping expectations deliberately low, then elegantly surpassing them. […] a portrait of a place as complete as any far-flung cosmos in a science-fiction space opera, and of an intricate trio of characters as intimately knowable and unknowable as any in contemporary fiction. Frankly, if you are holidaying in Italy this summer, I’d pack this instead of, not as well as, your Rough Guide. But my book of the year is Jonathan Buckley’s breathtakingly clever novel, Nostalgia (Sort of Books). Set in a small Tuscan town it puts before us not only the expatriate protagonists but also the town itself, its history, its local residents and their life histories, all interspersed with scholarly digressions. Wonderful. 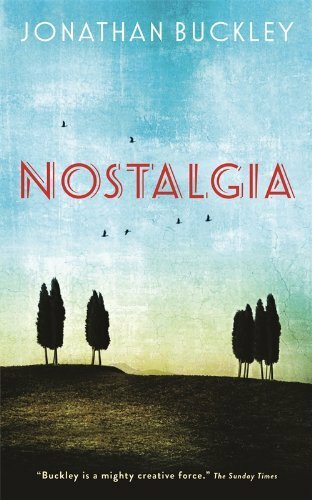 My favourite book of the year is Nostalgia by Jonathan Buckley (Sort of Books). It is impossible in a few words to do justice to the scope and depth of this multilayered novel, except to recommend it as warmly as possible. It is set in Castelluccio, a small town in Tuscany, the home of an ageing English painter, Gideon Westfall. Through many diffuse strands, which include documentation of Westfall’s work, Buckley paints a comprehensive picture of the town’s people, history, geography and mythology in a classic evocation of place.